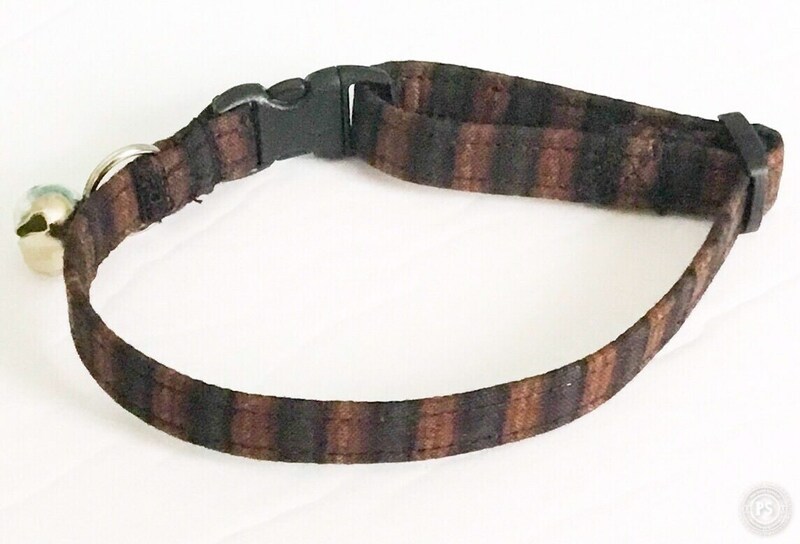 This Brown and Black Striped Adjustable Cat Collar comes with breakaway collar hardware and a bell. Black hardware was used on this breakaway striped cat collar but multiple buckle color options are given to you when ordering. (1/2”W and 5/8”W bands are available with black breakaway hardware. Please contact me via email if you would like a larger width collar for your kitty.) A matching bow tie or flower can be purchased with this cat collar in the options when ordering. All collars are custom made and are available in any fabric in my shop. I can also custom make a cat collar from a fabric of your choosing if you do not find what you are looking for in my shop. Please contact me via email in regards to this. All cat collars in my shop are of excellent quality. I use fabric and interfacing which is then wrapped around the webbing. All cat collars come with breakaway collar hardware for your kitty’s protection. A silver or gold bell comes standard with each cat collar. Non breakaway hardware can be used if requested. All cat collars can be made in asizes including XXS, XS, and S with option band width sizes of 3/8”W. ALL 3/8”W BUCKLES COME IN MULTI COLOR SELECTIONS. ALL Cats receive collar breakaway hardware unless otherwise requested. Please measure your cat’s neck prior to ordering to insure a correct fit. Please either use a soft measuring tape or a string when measuring. If using a string, place string around the neck where collar normally sits placing two fingers underneath as this allows extra space so the collar will not fit too snugly. When measuring with a measuring tape, follow the same procedure..
XXS- Fits neck sizes 5"-9"
XS.- Fits neck sizes 7"-11"
S - Fits neck sizes 10"- 15"
NOTE; As there are fabric variations throughout the pattern designs, your selection may not be completely identical to the image. Please note if you would like your selection identical to the image. Each collar can be machine washed on cold water delicate, however, I recommend hand washing or placing the collar in a small bag in the washer to prevent breakage of the hardware.